I'll be having 4 events from my side. Khatam Quran, Akad Nikah, Casual Reception and Formal Reception. So imagine the stress when planning everything to be perfect.. alone! I'm worried all the time. Caterers, videographers, entertainments, decorators, MCs, guest list etc etc! Sigh.. Being a perfectionist, stresses me out! Pffft. If only I can just leave and can't be bothered about everythingggg. The french lace detailing really makes the whole card looks wedding-y. I love it! "Manusia Hawa dijadikan daripada tulang rusuk manusia Adam, bukan dari kepalanya untuk dijunjung, bukan dari kakinya untuk dijadikan alas, tetapi dari sisinya untuk dijadikan teman hidupnya, dekat dengan lengannya untuk dilindungi dan dekat dengan hatinya utnuk dicintai"
So...... Hazim's MY HUSBAND? hehehe. Seven years ago, I didn't have anyyyy idea that I'm marrying that Jimbo boy! haha. God is the Best Planner, after all. Ok lah, I've got a heck of a lot of wedding works to do. Talk soon! Bye! nampak sgt nk menunjuk. 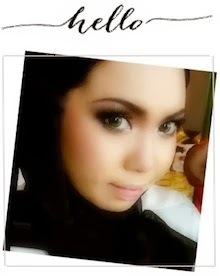 sampai ada 3 kad bagai..
Congrats dear Wani...=). Soon there will a lots haters and anonymous stay cool BRIDEZILLA. I believed that you hv such responsibilities to carries many events(i means akad nikah etc etc)for your side and his side. 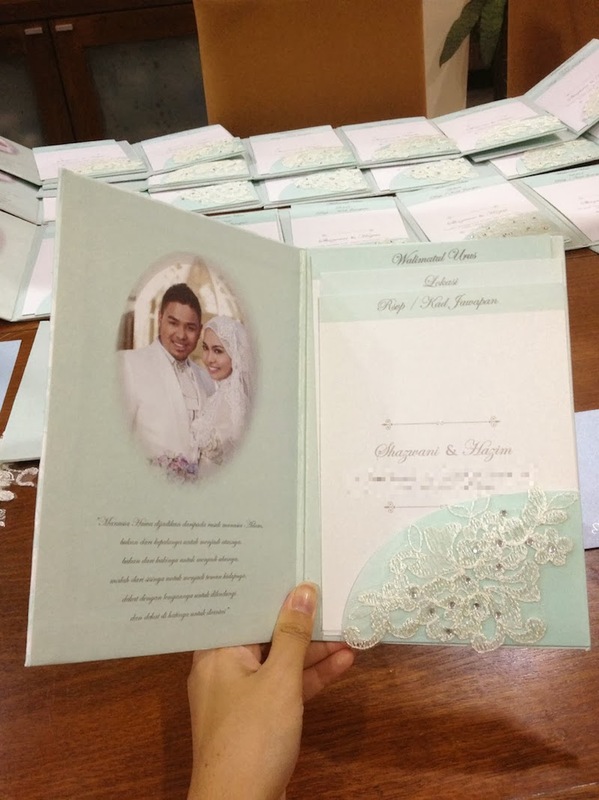 Stay positive and may Allah SWT ease your heart and days ahead..
akak suka ur wedding card.. cantiknyaaa!! the frame tu. suka sangat! we can never please others. enough to please people that's worth to please. senang cakap, kalau takde duit buat cara takde duit and no need to kutuk sana sini. well anyway wani, congrats. Alhamdulillah. i'm married and thank God i managed to go through it. But mine double the stress - documentations especially, marrying a non malaysian. but Alhamdulillah. all went well. Assalamualaikum..to haters,silalah berlapang dada..don't be a sore loser..Sederhana itu lebih baik..tapi Wani berkemampuan and dia nak a memorable wedding..let her be.Daripada mencerca/mengutuk lebih baik you doakan terbaik untuk Wani dan diri you sendiri moga dimurahkan rezeki dan ketenangan hati..Janganlah banyak sangat penyakit hati..To Wani, congratulations on your big day! Semoga kekal akhir hayat dan diredhai oleh Allah..InsyaALlah! Keep on updating ya! Just ignore what people say..it's your wedding. Be positive and enjoy it. May you get the best in everything. Just ignore all those nasty things. It's your wedding. Everyone have their own dream wedding. Be it simple, extravagant etc...it's a personal choice. Those people are jealous. People will always complaining. Aren't they? If you give them A, they will complain. Then you give B,they will still complaining. Just stay focus and enjoy the journey. Keep positive and may you get the best in everything. Senyum tu tak payah la terkeluar satu set gigi. Gatal sgt dah ke? I have to say, at least mizlynaibrahim tried to write in English. She needs to practice to improve, so let her practice. Why would you tell her otherwise? No one can move forward without learning. Cantiknya warna hijau kad ni.and this one is more hensem than the other one.hehehehhehe.just enjoy planning your wedding.its your day.takpa la pecah kepala sikit.nanti dah habis majlis legaaaa boleh tengok gamba smbil senyum senyum.all the best! 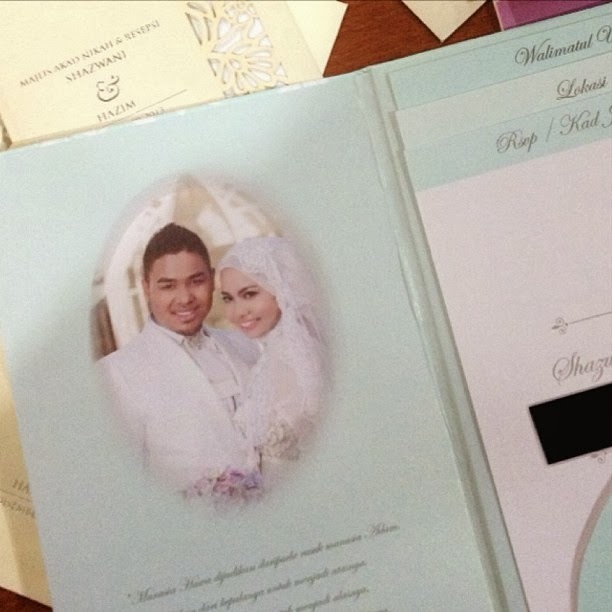 Congrats wani...luv your cards very much!! I have a few things to say. To those reader who hate/annoyed by reading anything about this girl; Just stop reading her blog and stop creating or accumulating your own sin (dosa). it's as easy as that. She have a right to do anything she wants. 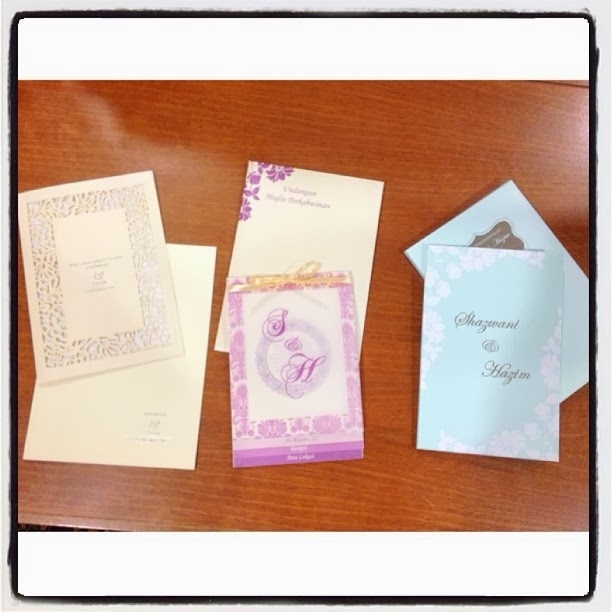 Her parent are well enough to support for the wedding. and believe me not, everyone here, if one fine day your own children want to get married, you will also tried your best to give everything to your own child. And do not blame or jealous with people. I believe her parent work so hard to be who, what and where they are today. It's not her fault of being born in well family and it's not her fault to be happy. She should be happy. I tak pernah bagi comment kat blog you, but now I do because I pun rase ape u rase. Being my own wedding planner, mmg stresssssss. I was a bridezilla too, almost 3 years ago and being stressed out, that was totally normal. I bukan before wedding je stressed, masa wedding pun stressed sbb i tetiber x suka pulak make up i masa sanding padehal before that okay je. I pun fickle minded mcm u kot. Hahha. But what i'm saying here, wedding/marriage ni bukannye everyday thing. Once in a lifetime, unless nk kawen byk kali la kan. So normal la kite stressed pikir mcm2 sbb nk event tu klo bleh perfect. Perfect for us, perfect for everyone. Kan kita hanya merancang, jadi x jadi tu out of our control. Ala..x da la mahal pun aku tengok hang punya wedding ni..kalau wedding ala2 maha firaun lagi grand dari ni..yg kaya bapak..bukan hang..huhuhu..